Ever since the Duchess of Cambridge went down the aisle in her stunning Sarah Burton design, lace gowns have come back in vogue. And why not? Lace gowns are timeless. It’s no coincidence that The Botanicals collection was photographed with lace gowns by the talented Suzanne Harward; I truly think that combining modern and traditional elements is the perfect way to celebrate a wedding. After all, what are weddings if not traditions? Lace is innately feminine, so romantically pure, and effortlessly elegant. Can’t you just imagine a traditional lace gown worn with your hair in a high, textured chignon, and a dewy, fresh face with an ever-so-slight stained lip? 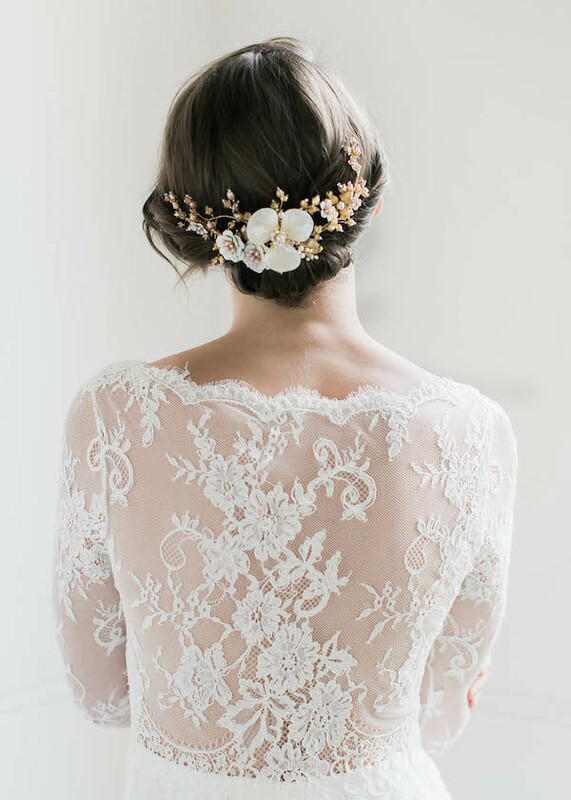 There are so many beautiful ways to accessorise your lace wedding dress without looking too frilly or lacey. The beauty of lace is that it pairs with so many gorgeous accents such as crystals, pearls, sheer tulle and also – yes, other laces! One of my favourite things about lace is it contrasts brilliantly against other textures and details. If you love lace, there’s a very good chance you’re also a little smitten with pearls and/or crystal details. So, don’t be afraid to bring in some pearly goodness or some bling to glam up your look. If you already feel quite traditional in your lace dress and want to make your look more ‘you’, there’s no reason why you can’t accent your look with a luxurious side comb or an elaborate headpiece. After all, when it comes to styling your bridal look, it comes down to the accessories and how you pull these pieces together. And remember, less is often more! While oh-so-simple, a raw edge veil enhances the silhouette of your dress and let’s you and your dress take centre stage. Depending on the cut of your veil, it can either elongate your silhouette or draw attention to the pretty accents and lines on your dress. For example, a subtle cascade to the sides of the veil can accent your waist. A hip length veil pairs beautifully with a form-fitting sheath dress. There’s a world of gorgeous headpieces and combs that pair with a raw edge veil – so don’t feel like a simpler veil means you’ll be missing out. This might scare a few of you… and equally, it might excite the rest of you! Matching lace with lace doesn’t have to be an exact science but it’s important that the colours are complementary as well as the general feel of the tones and textures. If your dress features a heavy lace, something a little lighter yet similar in texture and details can look incredible. Similarly, if your dress features a lace floral pattern, pair it with a simple scalloped lace trim to pull your look together. And vice versa. A lace mantilla-style veil create a glamorous and distinctively vintage look – perfect for making an amazing exit from a traditional church wedding. Another beautiful option is to pair your gown with a raw edge veil with lace accents. Untraditional, unexpected and perfect for modern romantics! Ah… It makes me want to get married all over again!